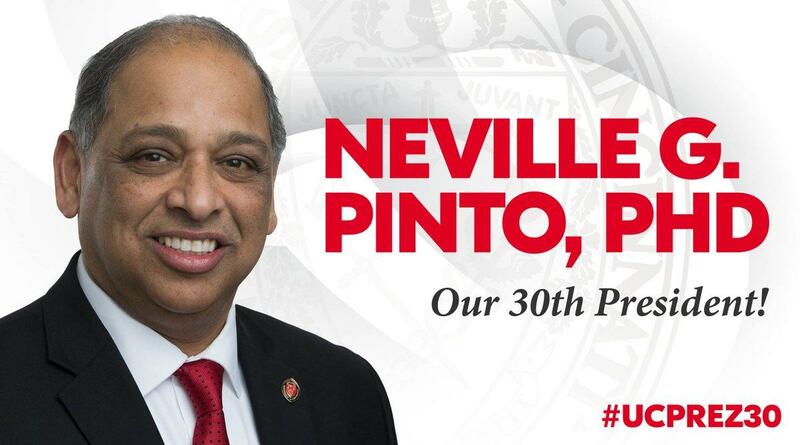 Neville Pinto serves as the 30th President of the University of Cincinnati. He took office on Feb. 20, 2017. As UC’s president, he has led the development of the university’s strategic direction, NEXT LIVES HERE, a new paradigm for university planning that the university launched in February 2018. NEXT LIVES HERE is a 10-year vision that allows the university to be nimble and responsive to the world’s changing landscape. It focuses on becoming a leader in innovation and impact with three main platforms of academic excellence, the innovation agenda and urban impact. As a part of these efforts, Pinto established a position for the university’s first Chief Innovation Officer while the university is poised to launch its 1819 Innovation Hub and opened its first Staff Success Center. Dr. Pinto is the first UC president to rise from the ranks of UC’s faculty since Herman Schneider, the founder of cooperative education (1928-1932). Pinto has spent his entire career as a university teacher, researcher and administrator. Just prior to returning to UC to serve as president, Dr. Pinto served as acting president and professor of chemical engineering at the University of Louisville. Before serving at the University of Louisville, he served for 26 years on the faculty in chemical engineering at the University of Cincinnati, where he established the Adsorption and Ion Exchange Laboratory, which focused on research in biochemical and environmental engineering. His research included purification of genetically engineered drugs, the study of bio-membranes, and air and water purification. His laboratory attracted over $6 million in external research funding and trained 32 graduate students including 16 PhD students, many of whom have moved on to become leaders in industry and academia. Earlier in his career at the University of Cincinnati, Pinto held a number of administrative posts including Department Head for Chemical Engineering, Assistant Dean for Graduate Studies in the College of Engineering and Applied Science, and Vice Provost and Dean of The Graduate School. As Dean, he had a leadership role in attracting major external awards totaling over $10 million to the University of Cincinnati to support graduate and STEM education. Pinto joined the University of Louisville as Dean of the Speed School of Engineering in 2011. While dean, his accomplishments included overseeing a major expansion in the enrollment of the college and spearheading the development of the Belknap Engineering and Applied Sciences Research Park. He significantly strengthened the university’s relationship with GE, to develop a partnership that has led to significant educational and career opportunities for students and encouraged the company to bring its FirstBuild microfactory to campus. This effort earned the Silver Fleur-de-Lis award from Greater Louisville Inc. in 2015. Pinto was born in Mumbai, India. He was educated at the Indian Institute of Technology, New Delhi, where he earned his bachelor’s in chemical engineering. He earned his MS and his PhD in chemical engineering at Penn State University. MENU: Chopped iceberg with shaved carrots, cabbage with Yum Yum dressing; Regular Entrée – stir-fried shrimp with garlic spinach & fried rice; and sugar cookie. ALTERNATE MENU: Vegetarian Entrée – stir-fried vegetables with garlic spinach & fried rice OR Salad Entrée – baby kale with bacon lardoons, bleu cheese crumbles and pear & citrus vinaigrette (GF).